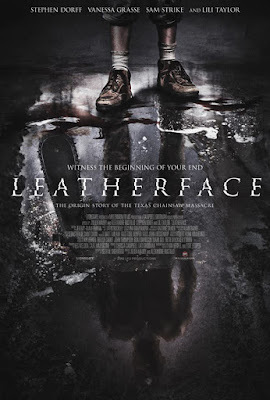 Set for release in 2016, and directed by Inside filmmakers Julien Maury and Alexandre Bustillo, Leatherface is being billed as a prequel to the original Texas Chain Saw Massacre, telling the origin story of a young Leatherface. The prequel will go further back into the character’s history than ever before and by doing that will make things even more complicated to understand. Here is the synopsis for the movie: A young nurse is kidnapped by a group of violent teens who escape from a mental hospital and take her on a road trip from hell. Pursued by an equally deranged lawman out for revenge, one of these teens is destined for tragedy and horrors that will destroy his mind, molding him into the monster we now call Leatherface. What I'm gathering here is that Bubba 'Leatherface' Sawyer isn't actually a Sawyer. He is just a crazy kid who escapes from a mental institution, with other crazy kids. Now if he is already crazy, what the hell could possibly destroy his mind making him crazier? Add to that, how does he become a member of the Sawyer family and doesn't this idea conflict with the fact that he actually is the son of Drayton Sawyer? Now remember they are ignoring the remakes, so none of that stuff counts. Just parts 1,2,3,4 and 3D fall in this series. Taking that into account, in 3D Verna explains who Bubba is and that he, along with Heather, is the last living Sawyer. Wouldn't she explain he was adopted if that was the case? Okay lets play this next scenario out. Maybe Bubba is a Sawyer who got locked up in a mental institution, but how would that happen? There is no way they would have let him get placed inside an institution. Also Grandpa is the one who started the tradition of catching and eating people, so Bubba would have grown up that way. I doubt anything could destroy a person's mind if their day consisted of hunting and cooking people for dinner. My point, even if there is one, is this. This movie doesn't sound like a prequel at all. It sounds like a bait-and-switch to get fans of the original series on board by saying it's a "prequel". At this point I wouldn't be surprised if this was worse than part 4 and that's a hard thing to do.